2016 Volkswagen Beetle 1.2 TSI 105 Dune review | What Car? 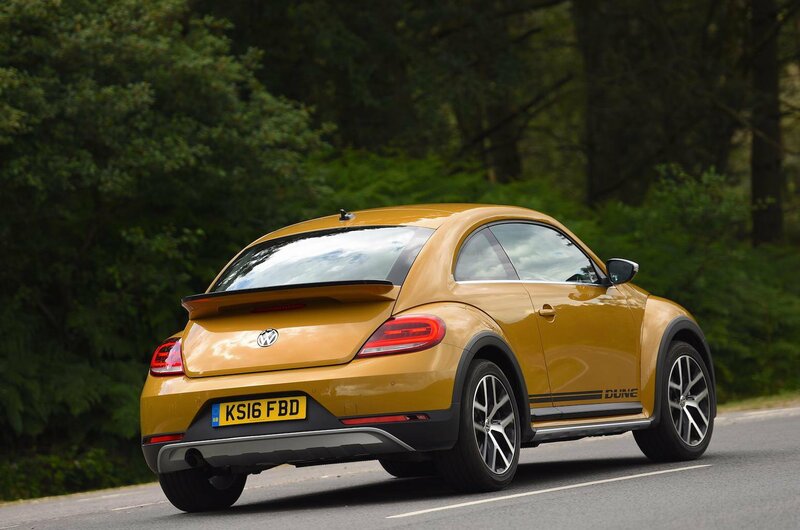 With raised suspension (by 1cm), front and rear wheel arch extensions, and a wider track, the Volkswagen Beetle Dune is inspired by the legendary off-road prepared 'Baja Bugs' of the late 1960s. However, with no four-wheel drive system (VW opted to use a front-wheel drive layout in the interest of weight saving) the Dune is best viewed as a styling exercise, rather than an attempt to create a light-off roader. Aesthetically, much has changed over the standard car. The Dune receives redesigned bumpers, smart looking LED tail-lights, a whale-tail esque spoiler, retro running boards and whopping 18in ‘Mythos’ alloy wheels. Combined with the striking optional Sandstorm Yellow paint, the Dune has real presence. 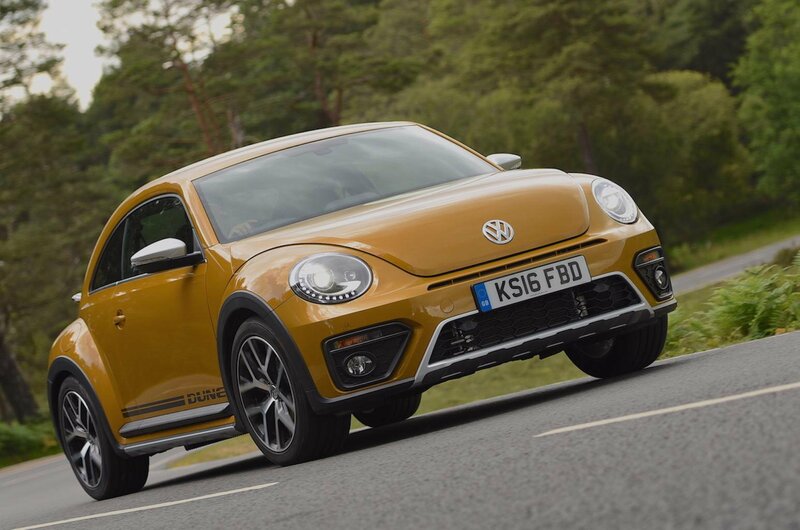 What is the 2016 Volkswagen Beetle 1.2 TSI 105 Dune like to drive? 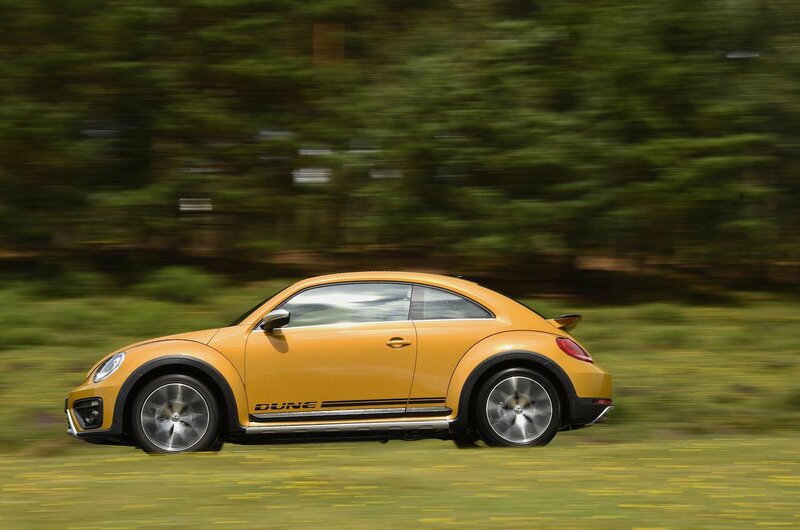 Considering its raised suspension, the Dune was never going to match the standard Beetle dynamically. Nonetheless, we were surprised with the car’s composure on fast and flowing B-roads. The steering is nicely weighted, body roll is well controlled and thanks to a widened track, the Dune produces reassuring levels of grip. Like the standard car, the ride quality is patchy at low speeds and the 18in wheels (standard fit on the Dune) certainly don’t help matters. However, once up to speed the car settles down well and the damping is well judged for British roads. In the UK, Dune buyers get the choice of two engines; the 104bhp 1.2-litre petrol we're driving or a more powerful 148bhp 2.0-litre diesel. The diesel is worth considering if you find yourself doing a lot of motorway miles, but for most situations the petrol is the better option. It’s a willing engine that isn't afraid to pull from low down and enjoys being revved. We also found it to be impressively frugal, returning 49.6mpg during our mixed roads drive. What is the 2016 Volkswagen Beetle 1.2 TSI 105 Dune like inside? On the inside the cabin receives some minor changes to set it apart from the standard Beetle. The bold paint scheme is carried over into the cabin thanks to wraparound inserts, the seats receive contrast stitching and the multifunction leather steering wheel gets a decorative 'Dune' insert. These little touches certainly help to give the car a premium feel, but on closer inspection it’s disappointing to find that the dashboard is littered with hard plastics. Combined with an outdated dashboard, you can’t help but feel that VW should be producing a better quality product for a car in this price range. 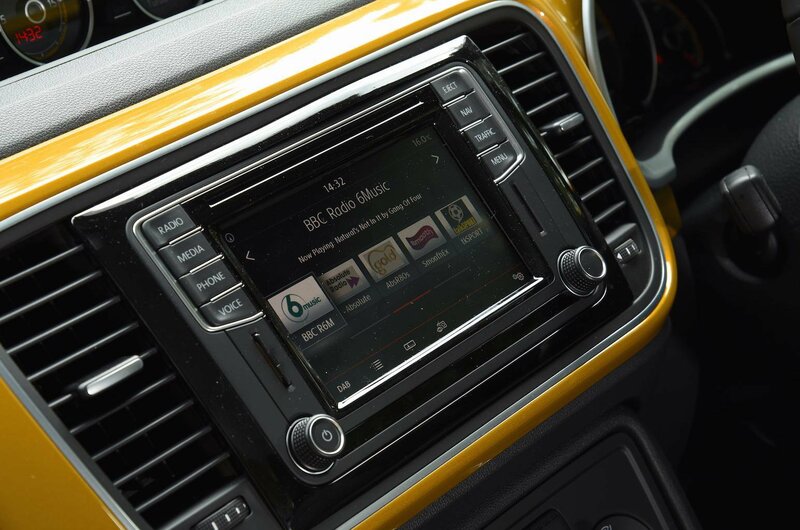 Unfortunately, the infotainment system does very little to resolve matters. The 6.5in screen is certainly easier to navigate than the 5.0in unit on entry-level models, but the software is clunky and the sat-nav is unintuitive. Ultimately, like the rest of the interior, the system is starting to show its age. Ergonomically the car is a mixed bag. There’s plenty of space up front, the interior is airy and the driver gets a great driving position with good visibility. The 310-litre boot is also plenty big enough for the odd trip to the beach, especially if you make use of the 50/50 folding seats. However, the Dune is not ideal if you have a family. Leg room in the rear is considerably worse than the (last generation) Golf on which it’s based, and head room is limited by the distinctive curved roofline. With its 'Baja' inspired looks and funky interior the Dune certainly feels more special than a regular Beetle, and for some, that will be a major attraction. But on paper, it’s hard to justify the cost over the similarly equipped and cheaper £15,935 Beetle Design. It’s also worth noting that with only two seats in the rear and limited leg room the Dune is also compromised as a family car. If you’re after practicality, you’d be better off with either a Fiat 500X or Mini Countryman; cars which also offer some (very) light off-road ability.